The Balinese celebrate the day of Galungan, which commemorates the triumph of Dharma over Adharma, or good against evil. Second in significance after the Nyepi or Saka New Year, this observance comes twice a Gregorian year, as the Balinese use a 210-day calendar system known as the Pawukon that is the basis for their daily rituals, temple anniversaries and holidays. Galungan is celebrated again December 25-27. 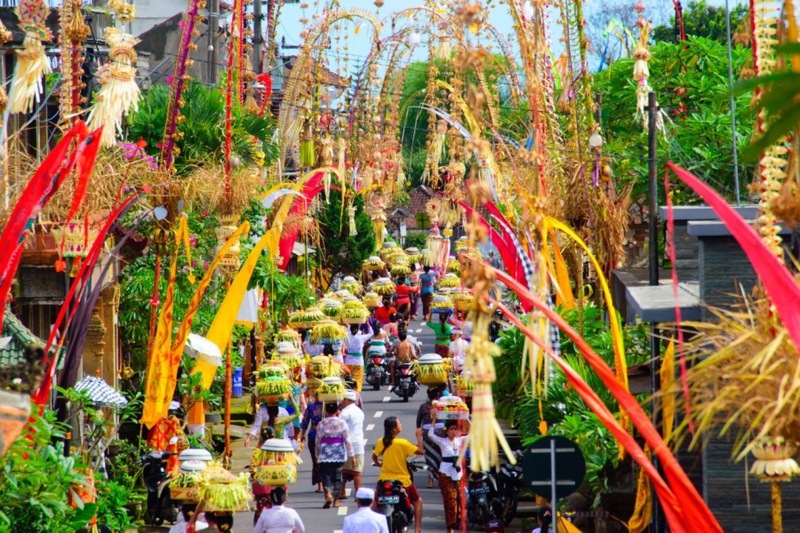 This year the Galungan festivity starts on a Tuesday on May 29 and December 25, when bamboo poles decorated with young coconut leaf decorations line the streets all over Bali. This is a unique welcome to Bali if you happen to be on the island around this time, and usually lasts until Kuningan, another associated observance that comes 10 days after on June 9. Traditionally, Galungan day sees the slaughtering of pigs for communal feasts, as well as baking traditional rice cakes and erecting iconic 'penjor' bamboo poles. These intricately decorated poles, naturally curved at the top, comprise harvest items such as rice, fruits, coconuts and coconut leaves. The men of the households erect their ‘artwork’ at each household gate on the eve, resulting in an impressive view throughout all village roads. Celebrants in traditional attire attend temple ceremonies with their families, bringing with them offerings of fruits to temples and family shrines – which they share and enjoy after prayers. The celebration peaks on Wednesday, May 30 and December 26, when people put on their finest clothes to visit family and temples. The day of Galungan is important for the Balinese, similar to a new year, when everyone returns to their families and home villages. The following Thursdays, Manis Galungan, like Boxing Day, is a day to visit friends and relatives or for fun family trips. Kuningan, on the other hand, marks the end of the 10-day festival. The ceremony surrounding Kuningan refers to special offerings made of yellow turmeric rice. Yellow is also the colour of the god Wisnu, the protector of the Hindu trinity. The Kuningan celebrations are most significant at Sakenan Temple on Serangan Island, southern Denpasar, which coincidentally celebrates its piodalan temple anniversary peak celebrations on the same day. The occasion features a series of sacred dance performances and rituals, with pilgrims attending from all over the island.